Found her on the 1880 Pike, Clark, Ohio census (dist 41 img 13) as Grace D. Austin age 1. Found her on the 1900 Springfield Ward 5, Clark, Ohio census (dist 33 img 4) as Grace Austin age 21, single, living at home. Found him on the 1850 Vernon, Clinton, Ohio census (img 36), age 8, born Ohio. Found him on the 1930 Jacobs Fork, Catawba, North Carolina census (dist 26 img 24) as William H. Bridges age 1. Found him on the 1880 New Albany Ward 4, Floyd, Indiana census (dist 70 img 2) as Conrad Broeker age 6. Father, mother born Indiana. Found him on the 1900 New Albany, Floyd, Indiana census (dist 58 img 20) as Conrad H. Broecker age 25, single, living at home. Driver, milk wagon. Found him on the 1910 New Albany Ward 2, Floyd, Indiana census (dist 71 img 1) as Conrad Broecker age 35, agent, insurance. Address: 411 Seventh St.
Middlesex, Nov. 8 - At nine o'clock Wednesday morning November 1 at the Baptist parsonage in Middlesex the Rev. John Scarberry united Miss Helen Dorman, younger daughter of Mr. and Mrs. Frank Dorman of East Hill, in marriage to Francis Davis, son of Mrs. Matilda Pelcher of Holley. Found her on the 1920 Potter, Yates, New York census (dist 184 img 15) as Hellen Dorman age 3. Found him on the 1850 Saugerties, Ulster, New York census (img 76) as Adam Finger age 10. Found him on the 1940 Houston, Harris, Texas census (dist 258-259 img 17) as Alan S. Finger age 4. Found her on the 1910 Berkeley, Alameda, California census (dist 68 img 29) as Cecilia Finger age 6. Found her on the 1920 Berkeley, Alameda, California census (dist 180 img 30) as Cecilia Finger age 16. Found her on the 1930 Berkeley, Alameda, California census (dist 272 img 19) as Cecilia E. Schaefer age 26. Boston Supervisor Jack Sedovy announced that 137th District Congressman Jack Kemp will officiate at the dedication ceremony of the David H. Finger Memorial Flagpole and Monument to be located at the Boston Town Park. 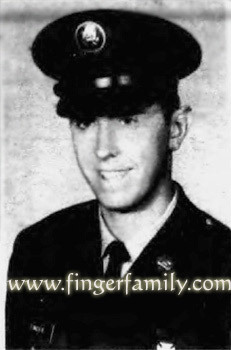 David, the son of Mr. and Mrs. Harold Finger and brother of Karen, Daniel, and Thomas Finger of Eckhardt Road in the Town of Boston, was the recipient of the Purple Heart, the Bronze Star for meritorious service and the Silver Star for galantry in action in the Republic of Viet Nam on the sixth day of August 1969. Pfc. Finger earned the Silver Star on the day he was killed. Serving in the lead position for a platoon operating in the A Shau Valley of South Viet Nam, he noticed some movement in the foliage ahead. Disregarding his own safety he advanced and killed two North Vietnamese snipers waiting to open fire. Further ahead he knocked out an enemy bunker with hand grenades but was killed in the process by enemy fire. He was 23 years old. In his senior year in high school, he was voted most valuable player of the Eden Varsity Baseball team. He played third base with the Boston Town team that won four Western New York suburban championships. A sportsmanship award is presented each year by the Boston Baseball Athletic Association to the athlete who best exemplifies the virtues of sportsmanship, dedication and fair play as set forth by the life of David Finger. The inscription on the David Finger Memorial Sportsmanship Award reads as follows, "He served God, Country, Family and Friends so well". The Memorial Flagpole and Monument have been erected at the Boston Town Park on a hill overlooking the new little league football field. The dedication will take place just prior to the first football game ever played on the new field between Boston and Gowanda. The dedication will begin at 2:00 p.m. Sunday. October 8, 1972. Friends and neighbors of the Finger family have gencrously contributed to the erection of this memorial to Dave's memorial. Special thanks were made to Paul Knox, Ivan Gillespie. Paul Schunk and Luke Fagnan for their special contribution to this cause. - Hamberg Photo News October 4, 1972 page 7. Found him on the 1860 District 12, Blount, Tennessee census (dist 12 img 3) age 15, single, living with his brothers and sisters, Henry, Eliza, Susan John and Frank. Found him on the 1870 District 6, Blount, Tennessee census (img 14) age 23, living next to his brothers and sisters. Found him on the 1880 District 6, Blount, Tennessee census (dist 192 img 10) as Marian Finger age 35, farmer. He is living next to his brothers and sisters Henry, Eliza, Susan and John. Found him on the 1920 Civil District 3, Loudon, Tennessee census (dist 151 img 6) age 74, widower, living with his daughter and son-in-law Matthew and Susie Cochrane. He applied for a Civil War Pension based on having rheumatism, and a gun shot wound. Found her on the 1900 Ripley, Tippah, Mississippi census (dist 105 img 1) as Mary E. Finger age 8. Found her on the 1910 Ripley, Tippah, Mississippi census (dist 97 img 13) as Mary Finger age 15. Found her on the 1920 Ripley, Tippah, Mississippi census (dist 62 img 4) as Martha Finger age 25, single, living at home. Saleslady, dry goods store. Found him on the 1930 Ripley, Tippah, Mississippi census (dist 4 img 12) as Marretta Finger age 36, single, living at home. Clerk. Found her on the 1900 Jacobs Fork, Catawba, North Carolina census (dist 42 img 15) as Rose E. Finger age 12. Found her on the 1920 Dallas Precinct 3, Dallas, Texas census (dist 156 img 5) as Rose DeManche age 32. Found her on the 1930 Waco, McLennan, Texas census (dist 33 img 32) as Rose E. DeManche age 42. Father: Henry Lohr FINGER Jr.
Found him on the 1850 Division 3, Tippah, Mississippi census (img 62) as William Finger age 2. Found him on the 1860 Northern Division, Tippah, Mississippi census (img 121) as Maj. Wm. Finger age 12. Found her on the 1850 District 10, Blount, Tennessee census (img 21) as Alta Gibbs age 3. Found her on the 1880 District 10, Blount, Tennessee census (dist 193 img 1) as Alta Finger age 33. Found her on the 1900 Civil District 10, Blount, Tennessee census (dist 21 img 14) as Alta Z. Finger age 53. Has given birth to 11 children, 10 are living. Found her on the 1910 Civil District 10, Blount, Tennessee census (dist 26 img 4) age 63, widow. Her daughter Emily age 17 is living with her. A number of her children and she are neighbors, Beecher, Minnie (widow of Buford Finger) and Florence. Found her on the 1920 Civil District 10, Blount, Tennessee census (dist 26 img 21) as Alta Finger age 73, widow. Her son John and his wife Lillie are living with her. Family 1 : Rosa A. Found him on the 1900 Cloud Chief, Washita, Oklahoma census (dist 207 img 18) as Leroy Hammons age 16. Found him on the 1930 Rocky, Washita, Oklahoma census (dist 21 img 10) as Roy H. Hammons age 45, proprietor, oil and gas retail station. Found him on the 1850 Whiteford, Monroe, Michigan census (img 5) as Abiel Lewis age 3. Found him on the 1860 Riga, Lenawee, Michigan census (img 8) as Adelbert Lewis age13. Found him on the 1880 Riga, Lenawee, Michigan census (dist 166 img 1) as Adelbert Lewis, age 32, farmer. Found him on the 1900 Riga, Lenawee, Michigan census (dist 57 img 32) as Adelbert Lewis age 56, widower. Farmer. This census says born JNov 1843. Found him on the 1920 Sylvania, Lucas, Ohio census (dist 11 img 11) as Adelbert Lewis age 73. Father born New York, mother born New Jersey. He is living in the household of his daughter and son-in-law Iley and Dana Chandler. Found him on the 1880 Salina, Onondaga, New York census (dist 194 img 12) as Oscar Littleboy age 18. He is a laborer in the household of Bridgette Molloy age 63. The funeral of R. Van Ness Lyle was held at the Vedder church in Gallatin on Sunday afternoon. A short funeral service was held at the home in Sharon, Ct., before the body was removed from the home. The funeral was in charge of Roberts and Sons of Pine Plains. Masonic services were held and interment was in the cemetery near the church, known as Vedder cemetery. Mr. Lyle was injured in an automobile. accident on Sunday evening, Sept. 17, on the Sharon-Lakeville road near Hotchkiss Hill. He was taken to the hospital at Sharon where he died on Sept. 28th. Lyle had received a fracture of the spine and the crushed vertabrae resulted in partial paralysis of both 'legs; pneumonia developed and the combination of both resulted in death. Van Ness Lyle was a Gallatin boy and attended the Gallatin schools. He was well liked by all his friends in Gallatin as well as elsewhere. After his marriage the family resided elsewhere than in Gallatin and for the past several years they had lived in Sharon, Conn., in the old Chas. Dakin house, also known as the Taylor Farm which is on the Indian Pond Road. He was the son of Herman V. Lyle and Cora A. (Fingar) Lyle, of Gallatin. It is fitting, that a great-greatgrandson of such a noted preached as the Rev. Hermanus V. Vedder should be buried in the same cemetery, at Vedder's; both church and cemetery were named after this noted preacher, whose pastorate there was during the period of 1803-64, during which time he also breached in Linlithgo. R. Van Ness Lyle's ancestors were all of Gallatin back to the 1790 period; they were of the prominent families of their time. Relatives and friends of his filled the Old Vedder church on Sunday afternoon when his funeral took place; even the aisles and gallery of the church were occupied; Masons from Connecticut Lodges and from the Stissing Lodge of Pine Plains took part in the Masonic services and members acted as bearers. There was no singing at the church services for Mr. Lyle. Flowers in abundance testified to the love and esteem in which he was held. Rev. W. A. Kilmer, pastor of Vedder's church was assisted in the church services by a pastor from a Conn, church. The funeral was one of the largest ever held in the church. The sympathy of the town and community is extended to his family, his parents, brothers and sister. His widow and two children survive; his father and mother, Mr. and Mrs. H. V. Lyle of Gallatin; a brother, Chester of Amenia; a brother, Stanley of Gallatin, and a sister, Mrs. Milton Bryant of Ancram, also survive; also uncles, aunts, cousins, nieces, nephews, residents of Gallatin nearby communities. Found him on the 1900 Pine Plains, Dutchess, New York census (dist 17 img 12) as Roy Vanness Lyle age 4. Found him on the 1910 Gallatin, Columbia, New York census (dist 11 img 1) as R Van Ness Lyle age 14. Found him on the 1930 Sharon, Litchfield, Connecticut census (dist 26 img 22) as Roy V. Lyle age 34, manager, private place. Found him on the 1910 Buffalo Ward 12, Erie, New York census (dist 117 img 9) as Geo Meister age 32. Driver, delivery wagon. Also in his household are his mother and father-in-law Michael and Elisabeth Finger. Found him on the 1880 Red Hook, Dutchess, New York census (dist 65 img 1) age 48, farmer. Found him on the 1850 Saugerties, New York census (img 67) as Charles German, age 19, boatman. Found him on the 1880 Saugerties, New York census (img 45) as Chas. Paries, age 47, boatman. Also in his household are stepsons William B. Stewart, age 21 and James A Stewart, age 19. Family 1 : James Franklin FINGER Jr.
Found her on the 1910 Knoxville, Knox, Tennessee census (dist 119 img 34) as Martha Finger age 40. Sanford Willard Smith, attorney at law, of Chatham, N. Y., was born August 19, 1869, in the town of Kinderhook, the birthplace of Martin Van Buren, and is the son of Henry Smith, a native of Chatham, and Rachel (Shaw) Smith, who was born near Inverness, Scotland. Henry Smith was educated at the common schools of his native town, and, upon arriving at a proper age, was apprenticed to the carpenter's trade, which he learned in all its details. When quite a young man, he went to Michigan, and worked at shipbuilding, after a time extending his travels to Milwaukee and Cincinnati, working at his trade in both of these places. He finally went to Kinderhook, settling at the old birthplace of Martin Van Buren. In 1874 he removed to his native town of Chatham, of which he has been a resident ever since. Mr. and Mrs. Smith had six children, the following of whom are living: Ellen C., a resident of Chatham; Mary L. wife of L. Stevenson of Lowell, Vt,; Robert H. and Sanford W., both of this city. Found him on the 1875 Chatham, Columbia, New York state census (E.D.01 img 26) as Sanferd Smith age 5. Found him on the 1900 Chatham, Columbia, New York census (dist 6 img 17) as Sanford Smith age 30, lawyer. Found him on the 1910 Bronx, New York, New York census (dist 1487 img 49) age 50. He and his wife are living next to their daughter and son-in-law Edward and Fannie Finger. Found her on the 1870 Copake, Columbia, New York census (img 11) as Belle Tanner age 3. Found her on the 1880 Copake, Columbia, New York census (dist 9 img 10) as Bell Tanner age 12. Found her on the 1900 Copake, Columbia, New York census (dist 11 img 6) as Belle Pells, age 33. Found her on the 1910 Copake, Columbia, New York census (dist 10 img 17) as Belle Pells age 42. Found him on the 1910 Princeton, Mercer, New Jersey census (dist 42 img 20) as Charles A. Task age 7. Found him on the 1920 Princeton, Mercer, New Jersey census (dist 45 img 14) as Charles A. Task age 18. Possible variation: Jack Veillette - Antoinette death certificate. Found her on the 1900 Stockport, Columbia, New York census (dist 27 img 43) as Nellie Van Alstyne age 16. Found her on the 1910 Stockport, Columbia, New York census (dist 31 img 39) as Nellie C. Van Alstyne age 24, single, living at home. Found him on the 1900 Gorham, Ontario, New York census (dist 66 img 20) as William H. Werley age 42, farmer. Father, mother born Germany. Found him on the 1900 Bethel, Fairfield, Connecticut census (dist 1 img 3) age 48, day laborer. Ten children.